I was invited to my friend's birthday dinner. 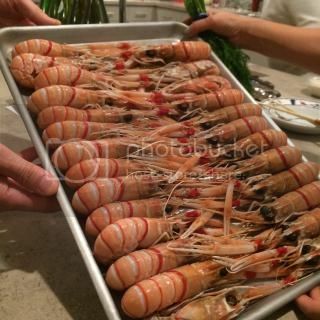 My friend and her husband import premium seafood to the US, and they generously provided all the seafood for us to cook for the dinner party. I was assigned to Tasmanian ocean trout. 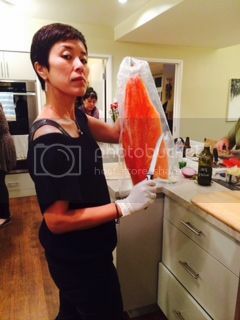 It was freshly filled, packed, and delivered to the kitchen just a day after the fish arrived to LA. 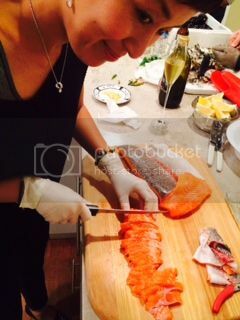 So, I made sashimi of this super fresh fish, first. White gloves on! Jody and Jimmy took these silly looking photos of me, as well as the top photo...thank you! 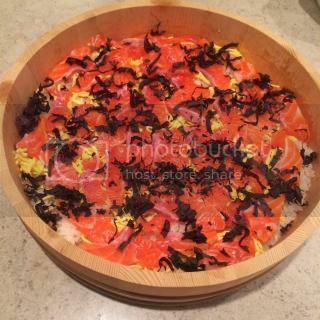 I made sushi rice with my double-lid donabe rice cooker, Kamado-san, and spread half of the sliced ocean trout over the sushi rice (garnished with thinly sliced omelet and chopped red shiso). You can find the basic chirashi sushi recipe in toiro kitchen's website here. Just change the toppings to make variations. The dish was a huge hit at the party! Of course, the quality of the fish was outstanding, and people were also just so amazed by how delicious the sushi rice itself was. I received comments from many people that they could actually taste each grain of the rice and the flavor was so delicious. I must say, it's because the rice was made in Kamado-san! It's the donabe magic. 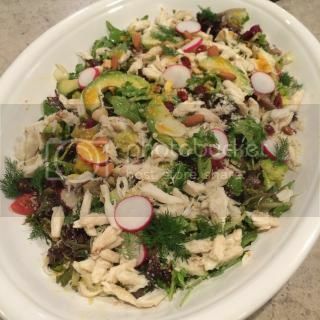 I also made crab salad. 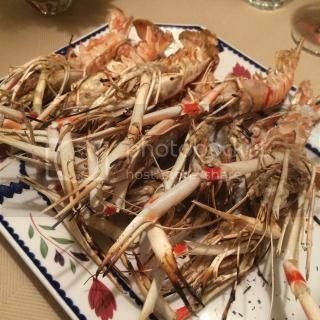 There were so many dishes and also wines...9 to 10 seafood courses and a dozen wines (among 10 people)! What a feast!